The home decluttering and organization craze is going at full speed. For those of us who like things tidy, this caddy project offers a pretty place to stow items you need to keep. 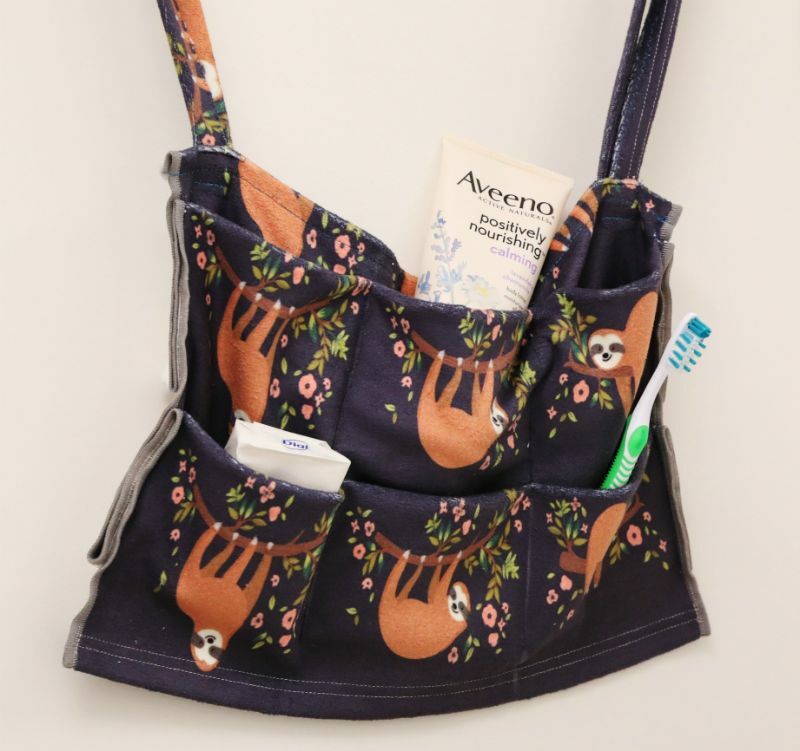 Whether it’s toiletries, art supplies or crafting necessities that need corralling, this caddy is definitely up to the task. Don’t let the folding and sewing portion of the project intimidate you. There’s a quick and easy way to create the pockets so they're sized and positioned to preference. Taking measurements of what will fill the pockets will avoid disappointment later, as the pockets will be correctly sized. The fact that the caddy can be customized with any fabric under the sun means the project can range from maximalist gorge to simple understatement, and everything in between. 1. Cut a rectangular piece of fabric about 2 feet wide by 4 feet long. 2. Place fabric on the cutting mat and, using a plastic sewing grid and a rotary cutter, cut two 1½ -inch-wide fabric strips from one end of the fabric. 3. Determine how many pockets you’d like on the piece and where they should be by folding and layering the fabric width-wise. Mark them with straight pins. 4. Using a colored pencil on the backside of the fabric, mark a ½-inch strip along the top and bottom edges of the fabric. Fold each end over where the line is drawn. 5. Pin the folded areas so they stay secure. Pins should be spaced about 1 inch apart. 6. Using the sewing machine, straight stitch these pieces down, removing the pins as you go. 7. Sew the pinned sides of the piece so they are finished. 8. 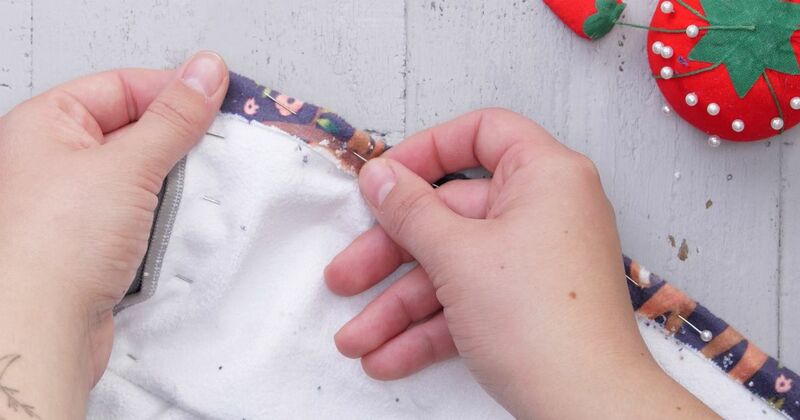 Cut away any excess thread from the fabric with the small sewing scissors. 9. Using a ruler and a piece of chalk, determine your preferred pocket width and mark with the chalk. 10. Take the two 1½ -inch strips and fold each of them lengthwise. 11. Pin them edge to edge. 12. Create the caddy’s pockets by stitching across the piece and following the chalk marks. 13. Take one strip and zigzag stitch it together, removing the pins as you go. 14. Repeat step 13 with the other strip. 15. Cut any excess thread from the strips using the small sewing scissors. 16. Make the strips into loops by pinning the ends together. These loops will allow the caddy to hang. 17. Pin the loops on the backside of the caddy at its right and left outer ends. 18. Stitch the loops to the caddy, removing the pins as you go. 19. After stitching, remove any excess thread with the scissors. Your space will no longer be a haven for clutter when this sweet but practical caddy is put to use storing whatever items need a place to live. Share this handy craft on Facebook.